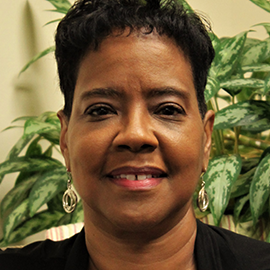 Reverend Renee Norwood began her career as a Hospice Chaplain in 2003 working for Optum Hospice and currently works for Hospice of the Chesapeake as part of the interdisciplinary team developing spiritual assessments and care plans. Rev. Norwood also provides pastoral counseling, bereavement support, officiates weddings, funerals and administers sacramental services for patients and families in Prince George’s County. Reverend Norwood received her MDiv from Wesley Theological Seminary in Washington, DC and her Master of Science in Professional Counseling from Loyola College in Columbia, Maryland. She is also an LCPC. She was ordained as an ordained Itinerant Elder in the AME church and is currently on staff at Reid Temple AME Church. She is the ministry leader for intercessory prayer and comfort. Reverend Norwood received her Bachelor of Science in Music Education from Gettysburg College, in Gettysburg, PA in 1982.